A strong second period saw Cork through by four points. A STRONG SECOND-half ensured Cork saw off Clare in the EirGrid Munster U20FC semi-final at Páirc Uí Rinn on Friday evening. Having gone in leading by 1-7 to 0-9 at half-time following a slow start to the first half, Cork seized control on the resumption, with five unanswered points putting them into a lead they wouldn’t relinquish. Half-forward Chris Óg Jones was the star turn for the Rebels, finishing with 1-7 to his name, with the goal ultimately the turning point. It came at a vital time. Cork had trailed by 0-6 to 0-3 following a bright Clare start with two earlier goal chances having been passed up by the home side, Cathal Maguire hitting the side-netting and Stephen Ryan denying Mark Keane. 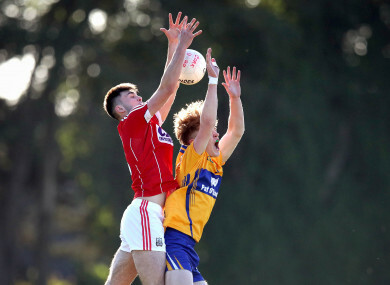 In contrast, Clare had been more clinical with Jonah Culligan and Dermot Coughlan on target for them, but Cork established parity when Jones received a pass from Tadhg Corkery and slalomed though the Clare defence before slotting home. Matthew Bradley was also among the scores for the Rebels as they established a two-point lead and though Culligan and Coughlan did tie matters again for Clare, but Jones had Cork in front at the break. Sub Colm Barrett had two points with Jones getting three more as Cork buttressed their lead early in the second half. Tom Hannon did have a late Clare goal opportunity which hit the top of the bar and went over and then Colm O’Brien’s shot had to be palmed over by Ian Giltinan, but Cork’s progression to next Friday’s final was never in doubt. Scorers for Clare: Jonah Culligan 0-5, Dermot Coughlan 0-4 (0-1 free), Darragh Bohannon, Tom Hannon, Seán Crowley, Joe McGann, Colm O’Brien, Jack Sheedy 0-1 each. Email “Cork U20s avoid shock at the hands of Clare to book Munster final showdown with Kerry”. Feedback on “Cork U20s avoid shock at the hands of Clare to book Munster final showdown with Kerry”.